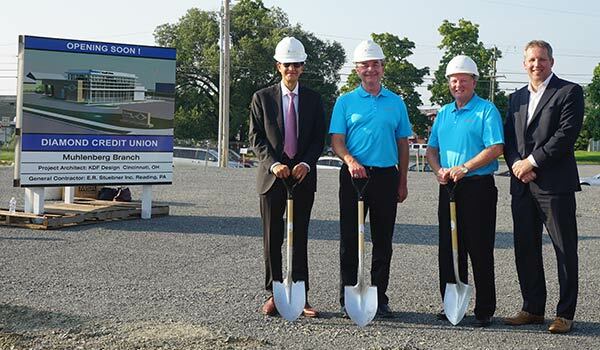 Diamond Credit Union hosted a groundbreaking ceremony in Muhlenberg Township, Pa. on August 28 at the site which will become the credit union’s seventh branch. This Muhlenberg location is expected to open in October 2019. This 4,560-square foot, state-of-the-art, free-standing, full-service branch will offer all the products, services, and personal attention Diamond is known for. Located at 4453 5th Street Highway, Temple, PA 19560, the branch is on the corner of Business 222N and Darby Avenue. This location is key in the revitalization efforts of Muhlenberg Township. Faust also cited the impact of the relationship Diamond enjoys with its Board of Directors; all employees; general contractor Doug George, owner, E.R. Stuebner Construction, Inc.; project architect Jeff Evans, CEO, KZF Design, Inc.; Muhlenberg Township officials; and Dr. Robert Hanna, owner of the land where the branch is being built. L-R: Dr. Robert Hanna, land owner; John Faust, President/CEO, Diamond Credit Union; Pat Austin, Chairman, Board of Directors, Diamond Credit Union; and Doug George, owner, E.R. Stuebner Construction, at the Muhlenberg groundbreaking for Diamond’s seventh branch. Younity is about personal relationships. It’s about real-life stories of people, just like you. It is over 61,000 of your friends and neighbors in Muhlenberg, Wyomissing, Exeter, Boyertown, Pottstown, and Royersford who have found stability and opportunity with their finances through Diamond Credit Union. Hear what some of them excitedly say. Here is why you should join. Joining Diamond is so much more than opening a new bank account. Sure, we have the products, features and services you’d expect from a big bank. But we measure profits by your success. This is why you should be with Diamond. This is our community too. Diamond is more than a great place to do your banking. Our staff is very active in our neighborhoods. Diamond is also ranked as one of the top places to work in Pennsylvania. We have tons of happy employees who are genuinely happy to take care of you. Out and About and Newsworthy! Diamond’s blog is a great place to learn more about Diamond, our products and services, our involvement in fundraising and the community, as well as educational articles on topics such as Mortgages, Small Business, Financial Planning, Fraud Protection, and Trending topics. Growing to bring opportunity to more members of our community … That’s younity! OPENING THIS FALL! Coming soon, Diamond’s footprint is also expanding into the Royersford area, Montgomery County. This, Diamond’s 6th branch, is on-schedule to open this October. Stay up-to-date on the latest construction progress. In the meantime, feel free to stop by any of our other locations throughout the tri-county area. Can’t wait for these new branches to open? Diamond Credit Union is open to anyone who lives, works, goes to school, or regularly conducts business in Berks County or the tri-county area. Read more on eligibility and why joining Diamond can make a difference in your financial future. If you already know your eligible and you’re ready, then we invite you to join the movement to Diamond right now online. I’M READY TO JOIN DIAMOND!